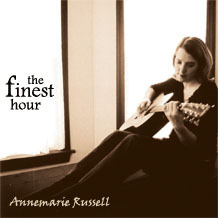 The Finest Hour is the third album for singer/songwriter Annemarie Russell, and the first album produced by New York City area musician Nathan Eklund. This album continues to exhibit Russell's creative and thought-provoking songwriting, and expands upon her previous albums musically with the addition of a full band, including horns. Russell is still featured on guitar and lead vocals, and New York City-area musicians Josh Dion (drums) and Thomas Hogan (bass) back her up throughout the whole album. Eklund, Craig Yaremko, and Shirantha Beddage provide extra texture as a horn section on selected numbers, while Princeton musician Amy McNelly and Eklund give support to Russell's words with their backing vocals. The album as a whole effectively combines Russell's folk-style attitude with a full band sound, and speaks thoughtfully to the listener through Russell's lyrics. As her strongest album to date, Annemarie Russell steps forward as a talented and passionate performer and songwriter in The Finest Hour.